Happy Friday, friends! I'm currently sitting in the Charlotte Douglas Airport, waiting for my connecting flight to Cleveland to pick up my repaired car. Why am I flying from Maryland to North Carolina to fly to Ohio? You can ask American Airlines that one (side eye). I could've flown direct with my trusty domestic carrier Southwest, but it cost way more than the corporate discounted price I was able to get for this flight. It's all good, though. Now I have time to write a post and linkup with the DC Trifecta (Mar, Courtney, and Cynthia)! This week's Friday Five theme is about your holiday wish list. This one was a little tricky for me, since it's always tough for me to come up with my wish list! My mom put together a gift exchange for my youngest sister, oldest younger brother (I didn't know how else to say it! ), my mom, and me. I had to come up with a wish list for my "elf," and it was not easy! Let's get to it, now, shall we? To come up with my short list, I asked myself the question, if I had $500 right now, how would I spend it? Here goes! Hiking Gear: Since I want to get outdoors more, I definitely need to update my hiking gear! I love hiking, but I just have my trusty hiking sneakers from 2006, and a Columbia fleece jacket. I would really like to get some hiking boots (I like these a lot), which I can wear when it really gets cold, and some pants that are ideal for hiking. I'm supposed to go on a hike with my boyfriend's sister tomorrow morning, so I may try to pick up some new pants after I pick up Coche. 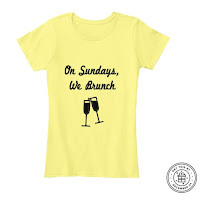 On Sundays, We Brunch Tee: I'm selling these tees, and need to sell just 8 more so that they can get printed! I placed an order for the yellow, women's t-shirt version (it comes in a few different styles), so I'm hoping they get printed so that I can wear it to my next brunch! Quality Time with My Family: I really enjoy the fact that I am fortunate enough to live near my family. This is my favorite time of year, and I love spending it with my favorite people. My boyfriend will be celebrating Christmas with my family this year, and I can't wait to share all of our traditions with him! What is on your wish list for this year? Have ever wished for something you thought you'd never get, only to have you own elf deliver it to you? GoPros are really fun to have! That being said, I admit, I have never used one but my husband does. He has shown me some super awesome scuba diving footage and it's the closest I will ever get to visit life undersea so I think that's pretty cool. I hope you get one! Thanks! They are super cool! I bet your husband's footage is amazing! I am glad that my schedule allows me to train during the day. If I had to get up early just to run, my training would never take place. Goodluck! My hubby gave me a GoPro Hero 4 last year for my birthday. BEST. GIFT. EVER!!! I used to hate getting up early, but after doing it for my long runs for so many year, I love it now!